Foundations of Physical Education, Exercise Science, and Sport 18 Edition The eighteenth edition of Foundations of Physical Education, Exercise Science, and Sport emphasizes the role of culturally competent professionals in meeting the needs of our increasingly diverse population and in promoting lifespan participation in physical activity for all people. Up-to-date statistics and information are provided on health and physical activity levels, career preparation and professional paths within physical education, exercise science, and sport. 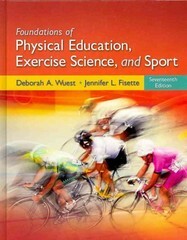 This edition retains its strong coverage of the foundations of motor behavior, biomechanics, exercise physiology, sport and exercise psychology, the sociology of sport, and physical education pedagogy. The text also emphasizes preparation for a diversity of careers in a variety of settings, addressing areas that include teaching, coaching, exercise leadership, athletic and personal training, sport management, and sport media.